"The" Launch? Well, "a" launch... the first for this epoch-making anthology. But an auspicious event for Australian west-coast daikaiju fans. I admit we were completely in the dark as to what sort of response we would get. We knew that only a few of the contributors would be there, and though there's a small, if vocal, group of G fans in the Perth area (including, of course, the anthology's co-editor, Robin Pen), we had no idea how the general run of SF conventioneers would react to a specialised collection of stories such as this. Moreover, we knew that Swancon -- an annual event with a long history -- would be a relatively small affair this year. The National SF convention had been awarded to Hobart in June -- and the Emerald Hotel in Perth, though a decent venue, had put a cap on numbers. So we weren't expecting big sales. Still, Agog! Press had determined that it was a good opportunity to sell to readers on that side of the country and a chance to celebrate the book there; and anyway, it was home seat of one of the co-editors (Robin Pen). So, off we went to Perth. The printers had sent four boxes of books ahead of us; these were resting in the care of Robin. Publisher Cat Sparks, author Deb Biancotti and myself arrived on Wednesday 23 March -- to temperatures of 43 degrees celsius. Daikaiju! editor Robert Hood and Agog! Press manager Cat Sparks ensconsed behind the sales table. Actually this picture was taken toward the end of the convention and from the look on my face the strain was beginning to show! The colourfully decorated books pictured on the right (our left) are copies of The Black Crusade, a darkly gothic comic novel by Daikaiju! 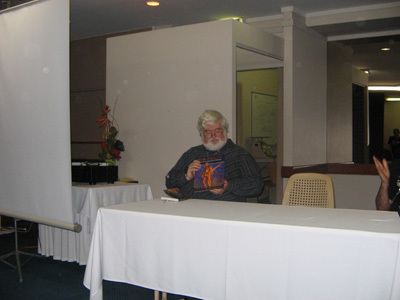 author Richard Harland, who is also from Sydney and was in attendance. 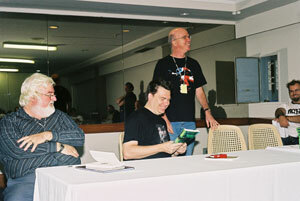 Richard looked after the table at times, particularly when Cat and I were on panels. The launch was scheduled for Saturday 26 March, at lunch time. Not an ideal time for attracting crowds. 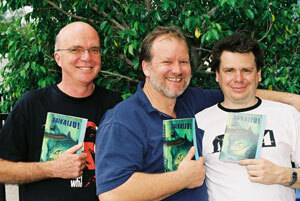 Nor was it ideal that it was a mass launch (involving three other books). In the event, however, plenty of people turned up and the mass nature of the event didn't affect the Daikaiju! anthology, which had a high profile by then and, if anything, unfortunately overshadowed the other books to some degree. 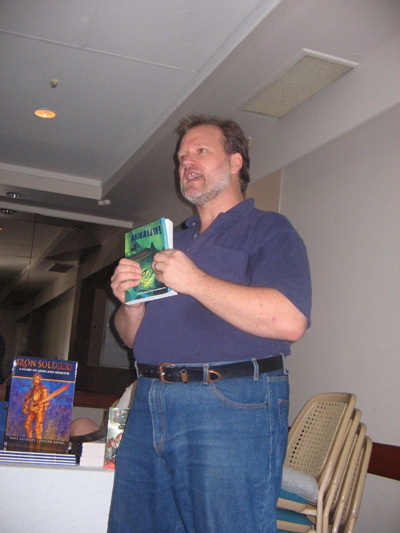 The book was to be launched by Jonathan Strahan, a well-respected reviewer and editor for Locus magazine, the standard industry journal for SF writers, publishers and readers in the US and worldwide. 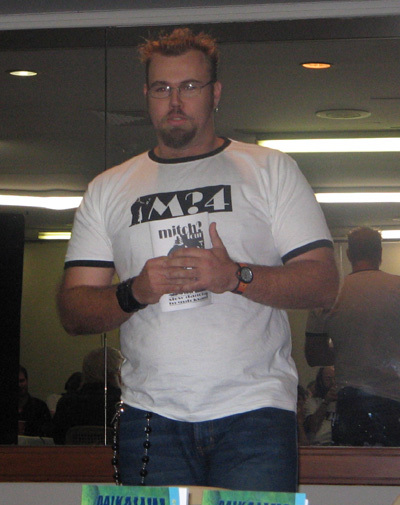 Jonathan, who has quite a list of edited anthologies to his name, lives in Perth and had readily agreed to force everyone to buy a copy before they could leave the launch venue. The mass launch was set for midday, combining books from Dave Luckett, Agog! Press and Mitch. Sometime around 11.30, Jonathan Strahan wandered in to the hucksters room. He had kindly agreed to launch Daikaiju! for us. Robin had said that Jonathan would be picking him, Mitch and the books up and driving into the con that day. I glanced around the room. "So where's Pen and the big fella?" I asked. Jonathan shrugged. I laughed. I sold a couple more books, and then it suddenly occurred to me that Jonathan wasn't joking. "Er... didn't you pick them up?" I asked. "Nope," said Jonathan. Apparently Robin had planned everything well, except for the bit where he actually mentioned to Jonathan that they needed a lift. It was twenty to twelve. I rang Robin. He was just starting to twig to the fact that something had gone wrong with his clever plan. Jonathan grabbed his car keys and raced out the door. It was now fifteen minutes to the launch. I had about six Daikaiju! books left from the first batch [we had sold nearly a box of them already... Rob] , no Robin and no Jonathan. The Mitch launch had no books at all and no Mitch. Oh well, I mused, what's a book launch without a little drama? At midday I picked up my six copies of Daikaiju! and wandered into the launch venue. Dave Luckett was already seated up one end of the table, all poised and ready to read. The rest of the table was very long, white and empty-looking. The audience rapidly began to fill the room. "Er... looks like you're going first, Dave," I said. Dave, unruffled, gave me one of those looks. Rob and I sat down and tried not to look too stupid. Dave began to read from his novel The Truth About Magic , and I relaxed a bit because Dave is one of those rare beasts: an author who can read his own work out loud in an audible and engaging manner. Soon myself and the whole room were engrossed in his book. So engrossed was I that I almost failed to notice Robin Pen's cheeky little face popping up at the back of the room. Twelve twenty. Robin poked out his tongue and made nya nya nya nya nya hand-waggly gestures in my direction. I crept around the edge of Dave, found a spot at the edge of the room and assumed the classic angry-housewife-with-rolling-pin position. Dave finished reading and a trolley load of Mitchs and Daikaijus were wheeled in. Rob and Robin kicked off the Daikaiju! launch, followed by Jonathan Strahan, who managed to inject a bit of class into the proceedings. Finally it was Mitch's go. He said some classic book launch stuff such as "this year I actually read some of the stories I published." Surprisingly, we sold a fair few books in the rumble that followed the last speech. And I suspect I'll have to get myself a copy of Luckett's new novel so that I can find out what happens next. 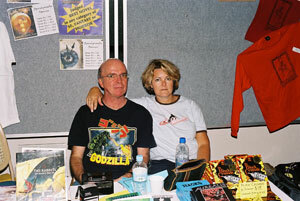 Cat's full convention report can be read on her website. Dave Luckett begins the mass launch by doing a show-and-tell with his new illustrated children's book on medieval armoury. 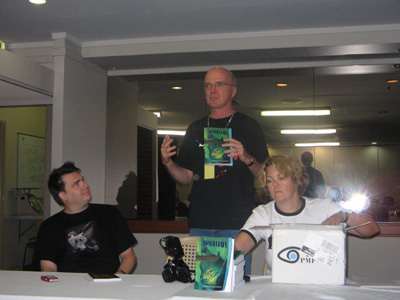 Robert Hood espousing the virtues of keeping giant monsters around the house, while Robin Pen looks on bemusedly and publisher Cat Sparks tries to arrange the books into a pyramid. Robert Hood, still going on. In a desperate attempt to stay awake, Robin Pen re-reads the back cover, while Dave Luckett wonders if he should start reading from The Truth About Magic again. At last, Jonathan Strahan launches the book! Mitch, a daikaiju-like editor in height and volume, launches his own book. It includes stories by Robert Hood, Cat Sparks and Robin Pen. 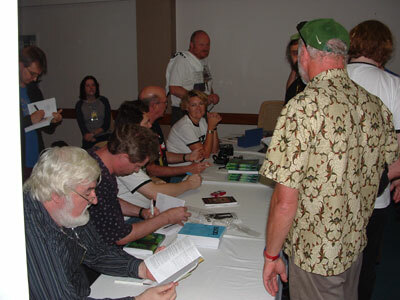 A signing session followed, where grateful authors wrote gushing messages in books bought by the adoring multitudes (though Dave, first on left at table, looks like he's reading Mitch?4). 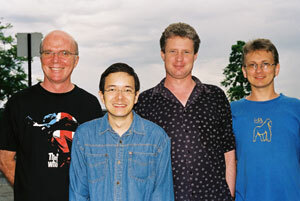 The others are: Petri Sinda (standing at far left), then on the table from left: Chris Dickinson, Robin Pen, Rob Hood, Cat Sparks. Other Daikaiju! authors who were present but aren't visible here were: Richard Harland and Martin Livings. Photo-op aftermath: celebrity launcher, Jonathan Strahan, sandwiched between co-editors, Robert Hood and Robin Pen. More photo-op aftermath: from left, editor Rob Hood, Shaun Tan (who isn't in the book, but is a superb artist -- see The Rabbits, The Lost Thing, The Red Tree -- and got dragged into the picture), and Daikaiju! 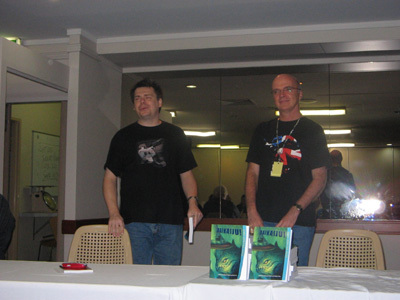 authors Chris Dickinson and Petri Sinda. Still no sign of Richard Harland and Martin Livings. Where were those guys? Probably gone to the bar already! Luckily all our initial uncertainties were unwarranted. Everyone was wildly excited about the book and lots bought a copy. All up, we sold three and a bit boxes of Daikaiju!s, so the launch can definitely be considered a success, given the size of the convention. At any rate, it was a great start to the anthology's career! A follow-up event took place at Conflux 2 in Canberra (22-24 April); and there will be more at Thylacon in Hobart, Tasmania (10-13 June) and at Continuum in Melbourne (15-17 July). If the anthology sells as well at these places, we might get to break even on expenses!